Pattern: My own toe-up pattern (with standard gusset incs and heel flap). MC: Easyknits Sushi Roll in Vlad. 330 yds per roll (used almost all of it). Used Judy’s Magic Cast on with CC. Continued CC through socks with simple intarsia-in-the-round technique. On one sock I moved the green “stem” stitches across with the main fabric with cable-like moves and on the other I inc/dec either side of CC yarn. Stems moved at random but in same general direction across the foot and then around the leg. Added a free-floating lace leaf at the end of the stems, and tacked it down at the point to the ribbing. 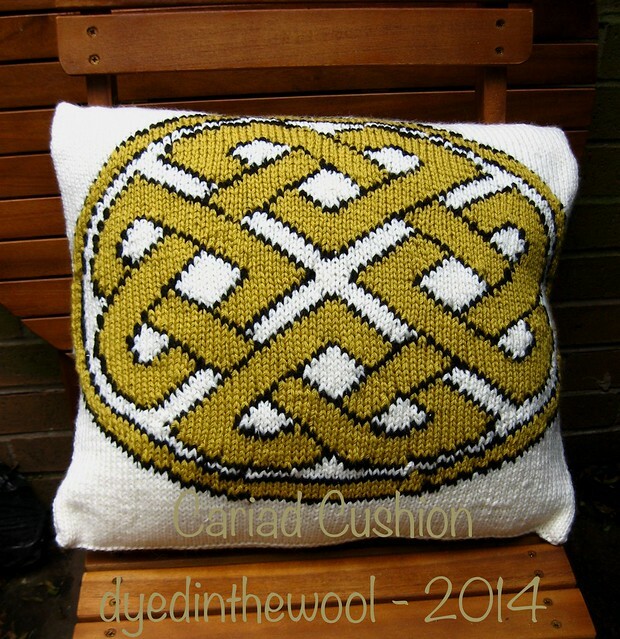 Available in issue 40 of Knit Now magazine. Well, that came around quickly/it feels like ages since I finished this! Such are joys of designing that you can forget you made something at the height of summer for publication in Autumn! 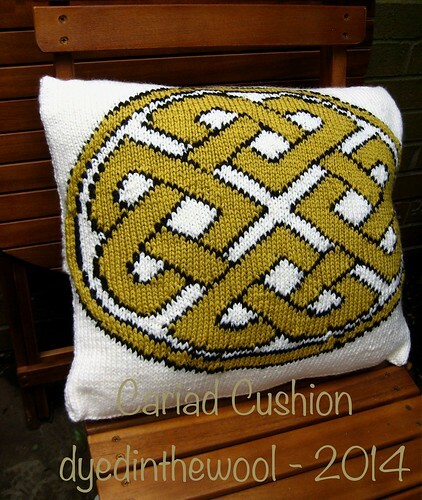 Inspired by all things Celtic, I designed this intarsia-technique cushion cover. It’s knit in a lovely, buttery-soft, Aran-weight yarn from Bergere de France called Magic+. 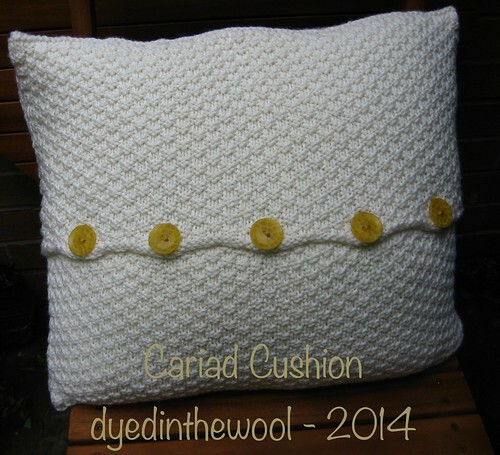 No fabric backs on my cushions! Knit Now issue 40 is available in supermarkets and newsagents across the UK (and possibly further afield) and you can also purchase either a paper or digital copy online. Well, I hope this explains why I’ve been quiet recently! This is my third pattern for Knit Now and, if it’s not too boastful, one I’m very pleased with. This is a “sampler” sock, with lots of different techniques in one piece, inspired by a traditional British picnic; gingham rug, picnic basket and parasol (or, more likely, an umbrella). 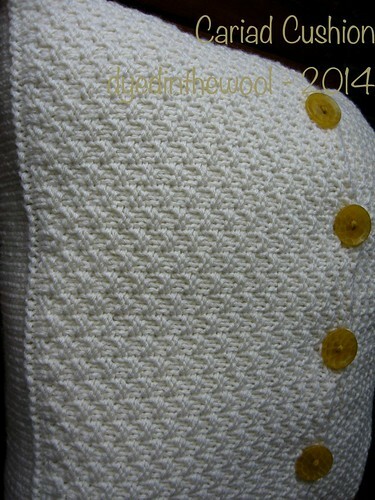 Details of (from top to bottom) ribbing, parasol handle and basketweave pattern, basketweave and gingham pattern. Strawberries & Cream in repose! Made in size M with no modifications. I liked the pattern so much that I have made a pair for me (well, only 1 sock so far but the second is on the needles)! Regia Silk and House of Xen version of pattern. Made in size L with heel modification. I wanted to show one of the heel modifications detailed in the pattern; the decreases are worked every 3rd round to increase the heel depth. This fits my foot/ankle very well. Knit Now Issue 23 is available via More Mags, some UK supermarkets and also available via the Apple App store for compatible devices.